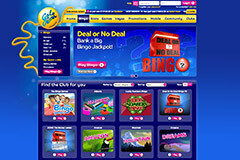 Gala Bingo are offering £45 free play when you create a new account at Gala Bingo and deposit £10. This offer is limited to one per new customer, and must be used within the first 28 days of opening your account. To recieve this offer you must spend a minimum of £10 on bingo tickets. For more than two decades, Gala Bingo has been serving the UK bingo market, establishing over 143 clubs, attracting some five million members and paying more than £42 million in prizes every week. 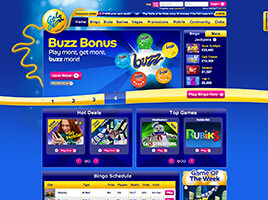 As part of the Gala Coral Group, Gala Interactive Ltd. operates GalaBingo.com 24/7, offering a vast array of online rooms to play in, friendly chat hosts to make players feel welcome and a constant flow of new promotions to keep regulars coming back for more. The website’s bingo games require no download. They are powered by a compendium of top applications from leading software developers, such as Ash Gaming, CryptoLogic, Electracade, Endemol Games, GTS, IGG, IGT Interactive and OpenBet, as well as Playtech, Quickspin AB, Spielo G2 and proprietary software—with all operations owned, operated and licensed in Gibraltar. The primary language is English and the main currency is the UK Pound. The focus of Gala Bingo is traditional 90-ball bingo with additional rooms provided for the 75-ball and 80-ball varieties. New games start every few seconds, featuring numerous daily prizes of £5.00~£300 and some jackpots paying up to £1,000~£3,000. Ticket prices start at just 1p and range upwards from 2p and 5p to the very common 10p and on to 15p, 20p, 25p and 50p. There are more than 70 mini games available, too, including Deal or No Deal, Soccer Wives, Frankie Dettori, Roulette and more. To add to the interaction, some 20 different chat games can be enjoyed while bingo sessions are in progress, such as Ch-phobia, I-Spy and What’s My Name. Also, separate tabs are featured for access to games, slots and the special Vegas area. Under the new catchphrase “You’ll Love the Buzz”, Gala Bingo has sought to distinguish itself from other bingo websites by emphasizing fun while creating a highly social atmosphere, rather like stepping into one of Gala’s bricks and mortar clubs. The “Community” section introduces chat hosts with profiles and photos along with a gallery of Gala Winners, who share their excitement about recent successes. Live Bingo is featured daily at 5pm, too, which takes the buzz to a whole new level as live presenters bring members live promos and live laughs. At the heat of Gala Bingo is the “Buzz Loyalty Scheme.” Players earn Buzz Bonus Points every time they buy bingo tickets or play in games with cash funds. For every £10 spent on bingo, from 75 to 175 points are earned, depending on the player’s status. There are five levels in the scheme, starting at Buzz Lite moving up to Buzz Main, Buzz Super, Buzz Supreme and Buzz Elite. All member receive daily free bingo entries, £20 refer-a-friend bonuses and the opportunity to redeem loyalty points for cash to spend on bingo at a rate of 500 Buzz points = 50p. Other benefits vary by status, including seasonal bonuses, a 15th of the month £1 drop, Double Buzz Point Sundays and VIP exclusives, such as 5% cash back up to £1,000 daily. Deposit matches are also offered. There are always lots of Buy-One-Get-One-Free bingo games going on in selected rooms, Penny Bingo games and progressive Bingo Linx daily, and Night Owl specials. Newcomers to Gala Bingo get a Welcome Bonus of £45 as soon as £10 has been spent on bingo tickets. They can also take advantage of the Newbie’s Room where they are entitled to play free bingo for £30 bonus funds over a 5-day period, starting on the day after they join. I have to say I love gala bingo. Their customer service has always been great whenever I`ve had problems depositing or withdrawing funds. There are so many bingo rooms that there`s always something going on and loads of friendly people in the chat. It`s just a nice environment to sit back and chill with some dirt-cheap bingo strips. The most I`ve ever won was about £90, so not a massive amount but not small either, and I don`t play too often or buy loads of tickets in one go. I normally stick to around £5 - £10 per fortnight. I would highly recommend them to anyone thinking of playing online bingo. Just try the games for free before! Hi I signed up on Saturday the 22/3/14 and deposited £10 played bingo but I`ve not received my £40 bonus so I went on and put a further £10 on and still on bonus please can you help? Signed up deposited £10. played it but I`ve to received my £40 bonus? Hi I`ve just registered on the site and didn`t receive any 10 pound for signing up help plz?? I`ve joined today but didn`t recover my joining credit? Got a £5 in the promise of getting £15 free played the £5 and nothing left it for 24hours just in case but still nothing???? HI I HAVE PLAYED 10.00 NOW BUT NO 20.00??? ?